Being a parent is tough work. And when your child has an anxiety disorder, the tough gets upgraded to downright hard. You love your child, and it hurts to see them afraid or constantly worried. But life needs to be lived, and schedules often need to be kept-especially if your child is in school! So, how can you manage your child's anxiety during those trying moments when you just need to get from A to B without losing your sanity? Helping Your Child Overcome Anxiety provides quick solutions based in evidence-based CBT and exposure therapy-two of the most effective treatments for anxiety disorders. You'll find a background and explanation of the different types of anxiety disorders, in case you aren't sure whether or not your child has one. You'll also learn to identify your child's avoidant and safety behaviors-the strategies your child uses to cope with their anxiety, such as repeatedly checking their homework or asking the same questions repeatedly-as well as anxiety triggers that set your child off. With this book, you'll find a wealth of information regarding your child's specific anxiety disorder and how to respond to it. For example, if your child has obsessive compulsive disorder (OCD, the skills you use to help them are different than other anxiety disorders. No matter your child's specific symptoms or diagnosis, you'll discover tailored interventions you can use now to help your child thrive. If your child has an anxiety disorder, simple, everyday activities can be a real challenge. The practical solutions in this book will help you deal with your child's anxiety when it happens and restore balance and order to both your lives. "This little gem of a book offers useful information for parents who are first learning about anxiety in their children. The book is highly approachable, and synthesizes much of the currently available information on child anxiety and evidence-based treatment strategies. Parents will particularly appreciate the friendly and unassuming language, and the real-life examples that bring many familiar dilemmas to life. The section on how not to 'feed your child's anxiety' will be especially useful for parents wondering how to help their child feel less anxious without contributing to the kind of unhelpful avoidance that maintains the problem. Bridget Flynn Walker has a clear voice and a knack for explaining ideas so that they just make sense." --Eli R. Lebowitz, PhD, associate director of the Anxiety and Mood Disorders Program, and assistant professor at the Yale Child Study Center "Bridget Flynn Walker's book tackles a complex and vexing problem for so many families, providing simple and easy-to-learn methods that will ease your child's anxiety and boost confidence. 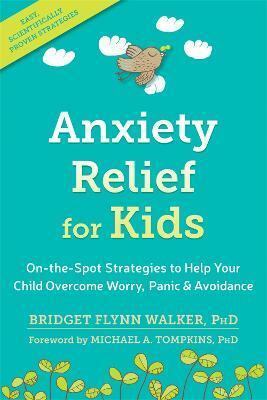 Anxiety Relief for Kids is a go-to resource for parents or anyone else trying to help a child with excessive anxiety. I recommend it highly." --Eli Merritt, MD, founder of Merritt Mental Health "This book is a much-needed resource for parents of kids with anxiety. It outlines essential psychoeducation about anxiety, and how to tackle its treatment. This book can help empower parents towards addressing their kid's anxiety and give them the essential tools needed to be successful." --Natalie Todd, PsyD, clinical psychologist at the University of California, San Francisco, working with teens and young adults "Bridget Flynn Walker's book, Anxiety Relief for Kids, provides an invaluable resource for parents and mental health professionals to help children manage and overcome anxiety. The book's approach is clear, concise, and informative. This step-by-step guide--full of evidence-based strategies to implement with children--uses easy-to-understand language, and offers vivid examples and helpful worksheets which make the book simple and effective to use." --Anya Ho, PhD, clinical psychologist at the San Francisco Group for Evidence-Based Psychotherapy "Just what the doctor ordered! A clear, concise, and practical guide to help parents help their children master their anxieties. I am confronted with patients and their parents every day who are searching for guidance in managing their children's omnipresent worries. The cognitive behavioral therapy (CBT) strategies outlined are easy to understand and straightforward to implement. This book provides a real-life tool kit that will help families and their physicians ease the fears that children often have." --Laurel J. Schultz, MD, MPH, community pediatrician at Golden Gate Pediatrics, and volunteer associate clinical faculty at the University of California, San Francisco "With warmth and wisdom, this valuable book provides hope and empowerment to parents. Bridget Flynn Walker provides a clear and easily readable understanding of what makes anxiety worse, and scientifically-proven strategies for managing anxiety. Most importantly, she provides a practical road map that parents can follow to help their children become braver and more confident in tackling their fears." --Aureen Pinto Wagner, PhD, director of The Anxiety Wellness Center in Cary, NC, and author of Worried No More "This book is a terrific resource for parents of anxious kids! Parents want to know what to do and what not to do to help their child with anxiety. Walker explains how trying to comfort your child can actually be feeding their anxiety. She offers up clear and powerful tools that parents can use with their child that will help them now and for the rest of their lives. --Jennifer Shannon, LMFT, author of The Anxiety Survival Guide for Teens "Bridget Flynn Walker has written a timely book. In our busy pediatric practice, we are seeing an increased number of children with anxiety these days. For parents and professionals alike, she clearly defines the different 'faces' of anxiety, and strategies that can be used to help our children and patients overcome them." Bridget Flynn Walker, PhD, is a graduate of the University of California, Berkeley. Walker received her PhD from the California School of Professional Psychology in 1991. In addition to fellowships at UCLA, Norwalk Hospital (Norwalk, CT) and Kaiser Permanente, Walker completed a two-year postdoctoral fellowship with Jeffrey Martin, PhD-an anxiety disorder specialist and professor at UCSF Medical School. For the past fifteen years, Walker's private practice has exclusively focused on assessing and treating children, adolescents, and adults with anxiety disorders and on training other mental health professionals to do the same using cognitive behavioral therapy (CBT). Walker's consultation and teaching services are requested by mental health professionals throughout the San Francisco Bay Area, and she is frequently asked to educate and guide school professionals in San Francisco and Marin Counties. Walker works closely with a team of pediatricians at Golden Gate Pediatrics, and regularly consults with leaders of the San Francisco Psychotherapy Research Group.